Ahhh- Seattle, Washington, and Athens, Georgia, we hardly knew ye’. What has become of your music scenes, Liverpool and Bakersfield? Once a site becomes worthy of pilgrimage, does that means it is no longer fully alive? What say you, Graceland and Rock Hall? The revival in the 1980’s gave me a name for this loosely defined music. 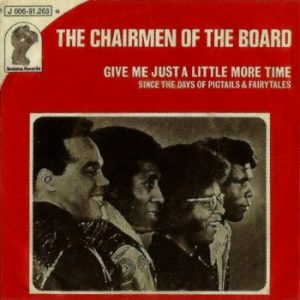 My “in” was Chairmen of the Board’s magnificent song. I moved on to The Showmen, The O’Kaysions and The Foundations. Apparently, the rest of the world has noticed Build Me Up Buttercup as it keeps popping up. Even more than all that, Doug Clark and the Hot Nuts… Really, what can one say? All of which gets you a genre. But not immortality. You need something unbelievably special. Check out J. J. Jackson’s But, It’s All Right– oh, sweet, lovely heaven. Pair that with Give Me Just A Little More Time on repeat and you’ve got some very, very happy ears. You may even have to try the Carolina Shag. I found myself on the Carolina shore a decade or so after getting my limited handle on the beach music concept. I didn’t do much to explore the music scene beyond tuning in a couple local radio stations. So, it’s a little strange to me that I can hear some of these songs and I’m back on that beach or standing on the porch looking out to sea. I can’t say that I smell the ocean, but I do feel the shadow of a lighthouse and sense the crash of the waves. More than a lot of artistic groupings, Carolina beach music feels de facto and haphazard, but that’s okay. Sometimes the only order we can bring is through our senses and not through pure logic. You’ve Got to Check This Out is a blog series about music, words, and all sorts of artistic matters. It started with an explanation. 113 more to go.